The ‘International Day of Persons with Disability’ is a United Nations international day that takes place annually on the 3rd December. The day works to raise awareness of the estimated 1billion people around the world that have some form of disability and yet, still do not enjoy access to society on an equal basis with others. The theme for this year is: “Empowering persons with disabilities and ensuring inclusiveness and equality”. The international day also links into Rights Respecting Schools initiatives, and PSHE lessons. To commemorate the day on the 3rd December some people choose to wear purple, and children may like to include purple on their posters, including purple ribbons. We would love schools to join us in raising awareness of this important day by encouraging students to take part in the poster competition. Posters can be on either A4 or A3 paper, hand drawn or made electronically on a computer/tablet. The whole school, specific year groups or classes can take part. Posted to: LAFI Burkina, 263 St Barnabas Rd, Woodford Green IG8 7DW. The winner of the competition will be announced via our website on 26th November. 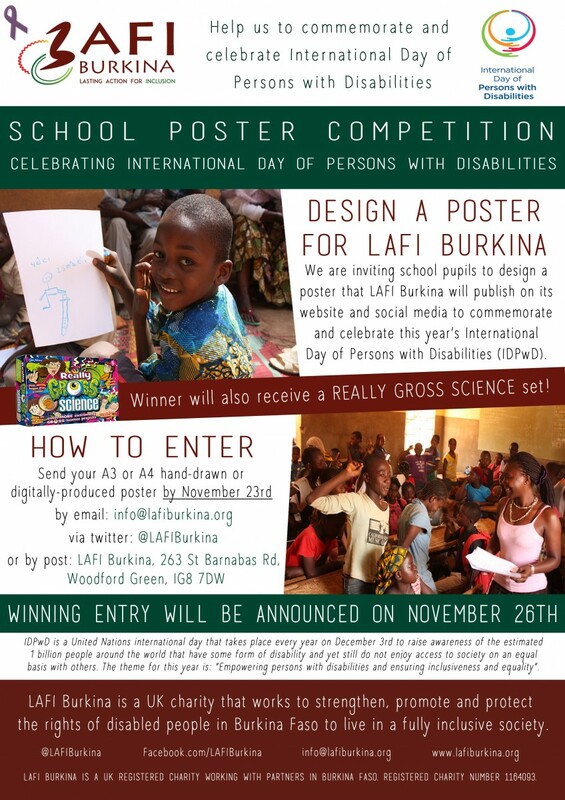 The winning poster will be published on our website, facebook page and twitter feed, and will be used by LAFI:Burkina to help publicise the International Day of Persons with Disability, for the week before the International Day, as well as on the 3rd December. We will not publish the winning child’s name just the “Winning entry is from a Year 4 pupil at NAME OF SCHOOL”. Please email info@lafiburkina.org with any questions or to let us know you are taking part.